​WE WILL BE ADDING MORE PAGES ASAP. Anatolia is a geographical region encompassing the whole of Asia Minor. It forms the Asian terrain of Turkey, bridging Asia with Europe. ​ WHY IS ANATOLIA IMPORTANT? The Anatolian Peninsula of Turkey has been the heartland of many great civilizations for millennia. A motherland of fertility, the image of the Earth Goddess arose here over 9,000 years ago. It sustains a biological and cultural diversity rarely found in other regions of the planet. Tulips, irises and many other popular garden plants originated here. Wheat, barley, chickpeas, almonds and many other important food crops were first domesticated from the wild in Anatolia’s fertile soil. 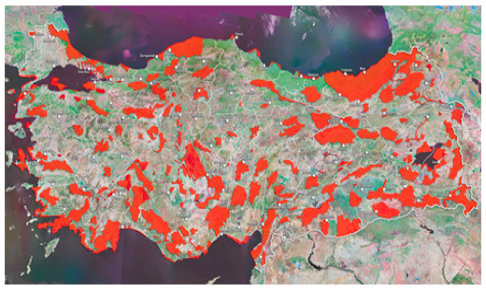 In these days of accelerating climate change, Anatolia remains a critically important source of genetic diversity. However, though this region harbors some of the most important ecosystems in the world, it is also one of the most endangered. Anatolia Foundation projects help empower village life and economics by building bridges between traditional wisdom and contemporary science; between conservation and marketing; between people and their unique environment. We believe that sustainability can be achieved by an integrated, holistic approach to all aspects of village life,which results in new understandings, skills and alternatives that can be transformed into new opportunities. Revival of heirloom food crops with organic farming methods. Preparation of organic and plant based products. Restoration of the natural habitat with scientific and educational programs. Data collection of ethnobotanical knowledge. Organization of village based ecotourism. Creation of village NGOs to involve women and youth in decision making for long-term sustainability. ANATOLIA FOUNDATION IS A NON-PROFIT 501(c)3 ORGANIZATION.